The Combat Hippies, as the word-slinging veteran group has come to be known, started through a creative writing workshop at MDC Live Arts, part of a veterans’ initiative funded by the John S. and James L. Knight Foundation. The writing lab was led by Castellanos and culminated with a reading of works so strong, that it led to a commissioned theatrical piece. “Conscience Under Fire” debuted the following season to packed houses and positive reviews. Since then, they have become a nationally touring theater ensemble, with funding from various sources including the Knight Foundation. In a coming-full-circle kind of way, The Combat Hippies’ commitment to conveying tales of resilience have in turn made them more resilient, and now they hope to share the heal. 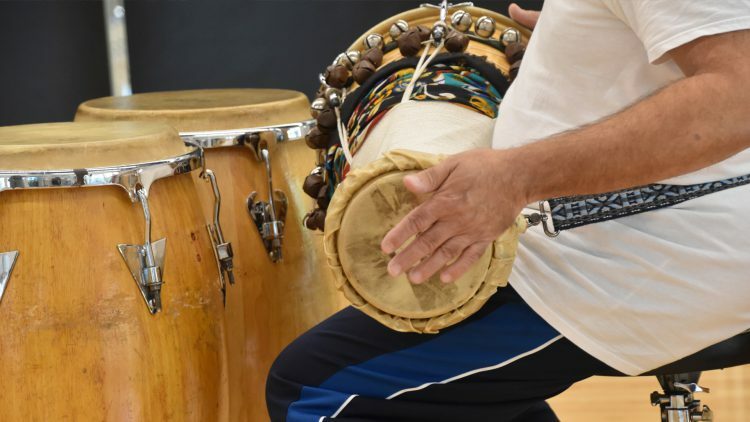 “There’s a lot to deal with when you come from rough neighborhoods, like in the Bronx, with its violence and drug use and trauma and stress already affecting you, and then you enlist and you’re exposed to a whole other level of trauma in combat,” said percussionist and cast member Angel Ruben Rodriguez, Sr. The Combat Hippies’ new work tackles important themes with equal parts humor and urgency. Tough and tender, Amal relays stories of the adjustments to life after war that veterans, refugees and civilians have to face. Drawing from personal narratives, and connecting significantly with the Syrian refugee community here in South Florida, Amal shares the unifying experiences of combatants and noncombatants as people of color. The Puerto Rican/ Nuyorican cast places a focus on Puerto Rico’s cultural and military heritage and also explores the quest for meaning, purpose and identity sought through enlistment in the military. The Combat Hippies are a Miami-based group of military/war veterans who’ve turned to the arts to heal and inspire. Born and raised in the South Bronx, Hipólito “the BeardMan” Arriaga was profoundly impacted by his childhood. In 2003, at age 19, he joined the US Marine Corps despite the US already being at war with both Afghanistan and Iraq. Following four years, including two deployments to Iraq, he separated from the military honorably. His experiences overseas pierced him heavily, and after returning home he began seeking healing for the various injuries he had sustained, physically, emotionally & spiritually, leading him on a journey of self-discovery. Hipólito is trained in Baptiste Power Yoga & Trauma Conscious Yoga. He also serves as a Wilderness Expedition Leader with No Barriers Warriors, guiding veterans on transformative curriculum-based adventures in nature and serves as a Peer Facilitator with Warrior Writers. Besides yoga and the outdoors, his passions include healing, reading, writing, community service, activism and assisting others in their growth journeys. Anthony Torres, Jr. was born in Brooklyn and raised in Utica, New York. He began his military career as a Civil Affairs Specialist in the Army Reserve from 1999-2002, then on active duty as a mental health specialist at Fort Hood, Texas from 2002-2006. In 2004 he was attached to the 115th Field Hospital and served on a 12-month deployment to Abu Ghraib Prison, Iraq. While deployed, he provided mental health treatment to both U.S. troops as well as Iraqi detainees. Following an honorable discharge he relocated to Miami, Florida and worked as a psychology technician at the Miami VA Medical Center from 2008-2013. He holds a MS in Psychology from Carlos Albizu University and a Master’s degree in Social Work from Barry University. Angel Ruben Rodriguez, Sr. is a musician, singer, poet, composer, arranger, actor, producer & educator born in Bayamon, Puerto Rico in 1954. He started playing drums at the age of nine; his first paid performance was at the age of 13. Angel volunteered for the US Army in 1972 at age 17 and served as a cook. He was promoted to Specialist (E-4) and was in charge of a mess hall until his discharge in 1974. For the past 45 years, Angel has dedicated himself to preserving & maintaining Puerto Rico’s rich musical culture. He has recorded and performed with important Latin musicians, and served as percussionist at the world-famous Apollo Theater Amateur Night with Ralph Cooper Sr. Some of his theater credits include “UBU Enchained” directed by Wiesaw Gorski and Steven Sapp and Full Circle Productions’ “Soul’er Powered”. One of Angel’s lasting legacies is helping to fund and run the Point CDC, a Bronx-based community center with the mission of developing and mentoring youth through the arts. Teo Castellanos is an actor/writer/director, who works in theater, film and television. His award-winning solo NE 2nd Avenue toured extensively for a decade and won the Fringe First Award at the Edinburgh Fringe Festival, Scotland 2003. His most recent solo, Third Trinity, was directed by Oscar winner Tarell Alvin McCraney, whom Teo has had a working relationship and friendship for over 25 years. He founded the Dance/Theater Company Teo Castellanos D-Projects in 2003 and is Artistic Director of the theater company Combat Hippies. Teo has toured solo and company works throughout the U.S., Europe, South America, China and the Caribbean. Some acting theater credits include playing Elegba in Tarell’s The Brothers Size, (Miami) and Santos in The Hittite Empire’s Skeletons of Fish (London). Film credits include playing opposite Matt Dillon in Sunlight Jr. and opposite John Leguizamo in Empire as well as in A Change of Heart with Jim Belushi. He is a United States Artist Fellow 2019 funded by the Doris Duke Charitable Foundation and a recipient of several awards and grants including NEA, NEFA, MAP, NPN, Knight New Works, Knight Arts Challenge, Knight Foundation People’s Choice Award, Miami-Dade County Cultural Affairs and also won the State of Florida Individual Artist Fellowship 2005 and 2013. He’s a Sundance Institute Screen Writers Intensive Fellow 2015. Teo is a member of SAG/AFTRA, and Society of Stage Directors and Choreographers and holds a BFA in Theater from Florida Atlantic University. Friday, March 29 at 8 p.m., and Saturday, March 30, at 8 p.m.